Depression can be a tough disorder to deal with on a day-to-day basis, and it affects many people. It is estimated that as many as one in 10 American adults suffers from the illness. There may be many medical treatment options available, but there are also some natural ways to fight depression that are free of the risks associated with pharmaceutical options. To fight depression, it is important to get enough sleep. Sleep deprivation can aggravate depression, as it can cause irrational thought patterns and increased stress levels. Promoting healthy sleeping patterns involves making sure your bedroom is cool, dark, and quiet, as well as going to bed at around the same time each night. Exercise encourages the release of the natural mood elevators serotonin and endorphins, making it a great way to fight depression naturally. It is important to get approximately 20 - 30 minutes of exercise every day for overall well-being, as well as mental health. Cycling, swimming, walking, or even gardening are all possible ways to lift mood. 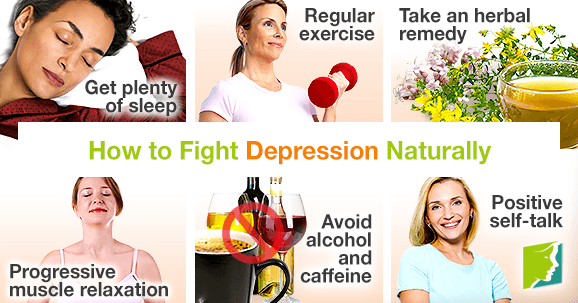 In order to fight depression, an herbal supplement could help give you the initial motivation. No pill should be thought of as a cure on its own, but the power of nature can be used alongside healthy lifestyle habits to keep depression at bay. St. John's wort and valerian are both herbs that have been shown to lift mood. Valerian contains compounds that have a relaxant effect, and it is thought that St. John's wort prolongs the action of serotonin in the brain. However, before taking any supplements, it is important to first consult your doctor. Taking 10 - 15 minutes a day to find somewhere quiet and free of distractions is a wonderful way to fight depression naturally, as it reduces stress levels and promotes an overall sense of well-being. The exercise below is one that you could try. Take a few deep breaths and then identify the tense areas in your body. In order to loosen these areas, tense them and then release. Then, roll your head smoothly a couple of times before rolling your shoulders forward and backwards once or twice. Afterwards, let all your muscles relax and recall a pleasant thought for a few seconds. Take a few more deep breaths. Exhale. Alcohol and drugs can have potent effects on the body, and what begins as a coping mechanism or a bit of fun can turn into a downward spiral of depression. Alcohol is a strong depressant, so it serves only to amplify negative feelings, while caffeine is a stimulant, and too much can result in jitteriness or nervousness. Depression leads to low self-esteem, which can intensify the condition. To fight depression naturally, it is important to practice being kind to yourself, and for some people, this can be difficult. The first step is to counteract each negative thought with a positive statement, saying it out loud if the situation permits. Additionally, whenever you rebuke yourself for something, envision what you would say if a friend found herself in that situation - it would probably be a lot kinder. Be your own best friend. Eventually, this positive mindset will become habitual. Depression is unpleasant, so it is important to deal with its symptoms as soon as they arise. Many people are unsure about conventional antidepressants, as they can often come with side effects. To fight depression naturally, follow the points above. This could be enough, but if the depression persists, it is important to tell your doctor your concerns. Love, S. & Lindsey, K. (2003). Dr. Susan Love's Menopause & Hormone Book. New York: Three Rivers Press. What Does Clinical Depression Mean? How to deal with menopausal depression is finally feasible with these 10 tips. Learn more here to get out of the blues today. Studies have been conducted on the relationship between food and the brain, and show that certain nutrients can actually improve mood. Midlife is often difficult for women. Depression affects twice as many women as it does men.